#2-418 a pair of faceted crystal single light arm over a black and nickel backplate. #2-423 a pair of white porcelain and brass single light sconces. 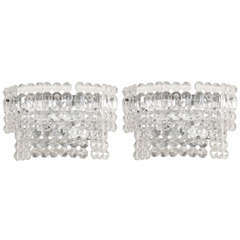 #2-409 a pair of silver plated double arm sconce having a crystal bobeches and backplate rosette. A pair of English Victorian single arm wall sconces, with decorative silvered bronze back plates and good quality cut glass arms, drip pans and pendants. Formerly for gas. A vintage pair of Italian clear faceted glass wall-mounted lights. Reduced from: $3,600. Glamorous pair of sconces by Kinkeldey. The gold-plated frames supported hexagonal crystal prisms which are stunning when illuminated. The sconces have been newly rewired for the US. 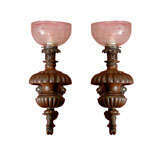 Fine pair of single light sconces with acid etched shades, they were oil lamps but have been electrified. Elegant pair of faceted crystal sconces on polished 22-karat gold plated backplates. Each sconce has seven crystal elements and two-light sources that have been newly rewired. Exceptional pair of faceted crystal sconces on 22-karat gold-plated backplates. Each sconce consists of seven crystal prisms and two light sockets.